Marcus Ginyard Basketball Camp 2016! We are absolutely thrilled to announce the fifth annual Marcus Ginyard Basketball Camp, which will be held in our two Northern Virginia locations! 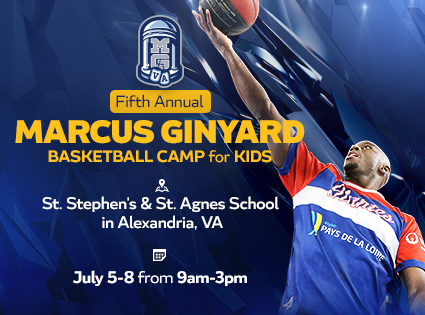 Our first session of camp will be held July 5-8 at St. Stephen’s & St. Agnes School in Alexandria. The second session will be held July 25-29 at The Langley School in McLean. The Marcus Ginyard Basketball Camp takes pride in the culture of hard work, sacrifice and teamwork, while still emphasizing having fun! We have been extremely blessed to share our love for the game of basketball with hundreds of campers over the years, and we look forward to sharing our passion with you this summer! Click on your location to register!